If you’re only drinking your beer, you’re missing out! Beer is a great ingredient to use in the kitchen for desserts like this Guinness & Bailey’s ice cream, as well as more savory dishes like beef and beer chili. 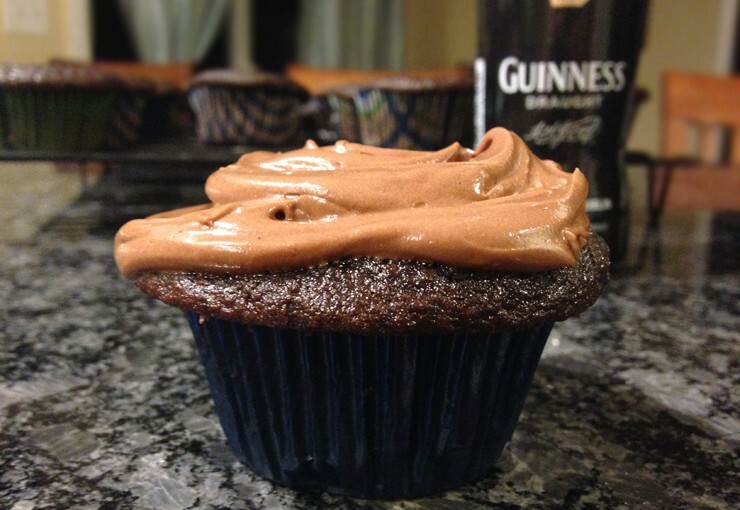 This time around, I turned on the oven (despite the blistering heat and humidity) and used beer to make some delicious chocolate stout cupcakes. You can use any dark beer that you like – I chose Guinness, a versatile dry Irish stout that we carry in our Around the World beer buckets. The roasted malty notes play so well with the chocolate. To up the chocolate ante even more, feel free to use a chocolate milk stout or other craft beer that you prefer. I topped off my cupcakes with one of my favorite chocolate/coffee buttercream frostings, but you can again play around with this and use one you like best. Smitten Kitchen has a great one if you wanted to do a play on an Irish Car Bomb – the frosting is made with Bailey’s and the cupcakes have a whiskey-laden ganache filling. Preheat the oven to 350° Fahrenheit. Line 2 muffin pans with cupcake liners – I got 22 cupcakes out of this recipe. In a large saucepan, bring the stout and butter to a simmer over medium heat. Remove from the heat and add the cocoa powder and whisk until smooth; let cool slightly. Whisk together the espresso powder, flour, sugar, baking soda and salt. In the bowl of an electric mixer, beat together the eggs, sour cream, and vanilla bean paste. Add the stout mixture and beat until just combined. Add in the flour mixture and beat on low speed briefly and then finish by folding the batter together with a spatula. Fill the cupcake liners about ¾ full and cook for 15-20 minutes, or until a tester comes out clean. I like to rotate the pans halfway through cooking time for evenness. Remove cupcakes from the pan and cool on a wire rack. Frost when cooled completely. In a microwaveable safe bowl, melt the chopped chocolate in 30 second intervals, stirring after each until mostly melted. Then stir until the chocolate is completely melted and set aside. In the bowl of an electric mixer, beat the butter at medium speed until it’s light and fluffy. Add the egg yolk and vanilla bean paste and beat for 1 minute. At low speed, beat in the confectioner’s sugar until fully combined. In a small bowl, dissolve the instant coffee with the hot water and slowly beat into the frosting. Slowly beat in the melted chocolate until fully combined. Frost on the cooled cupcakes and enjoy!